Having developed his love of theatre on stage, acting in performances including Shakespeare and musicals in the U.K. Michael has gone on to stage manage, direct one act plays and theatre shows. 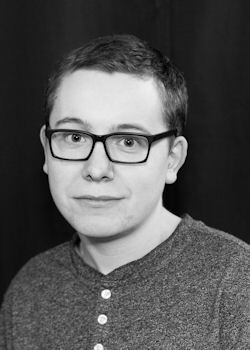 A recent graduate from the Theatre and Entertainment Production program at Red Deer College Michael is excited to take on the challenge of Lighting Design for Red Deer Players latest show Mass Appeal. He would like to thank the Director, Cast/Crew and most of all the audience for coming to see the show. Selected technical credits include: Stage Manager and Lighting Designer for a show named Sonder, which appeared at the Edmonton Fringe 2014, Stage manager for RDC 2014 show Under Milk Wood directed by Tom Bradshaw, Lighting Operator in RDC musical Edwin Drood and Assistant Stage Manager for RDC 2014 show William Shakespeare Land of the Dead directed by Kelly Reay based out of Calgary. Having experienced the thrill of the Edmonton Fringe once Michael is delighted to say that he will be returning to the fringe in August 2016 looking after all things technical for a brand new theatre company Innocent Operations. If you're at the 2016 fringe come check us out !